Snooper SC5900 DVR Ventura is designed for use by caravanners or in a motorhome. Street-level maps for UK and all of Europe are included for FREE and can be updated for FREE too. THe SC5900 DVR is Windows and Mac compatible. To read more about the Snooper SC5900 DVR range which includes truck version, coach version and car version please click here. 1 Year Guarantee with FREE delivery. Snooper SC5900 DVR Ventura Europe with FREE lifetime map updates £279.99. Delivery in the United Kingdom (UK) is FREE on all orders over £50. Delivery outside the UK costs £14.99 within Europe and up to £29.99 for the rest of the World. For more information please see delivery information. 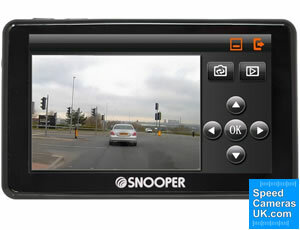 The Snooper SC5900 DVR is a satnav with a built-in dash cam. You will get spoken navigational directions to your destination with a map on screen. You can also playback video recorded using the dash cam instantly so you will always be able to check what happened in the event of an incident as you will have documented, videoed proof. Access to Snoopers AURA speed camera database is optional and it will provide speed camera alerts for both fixed and mobile speed camera locations. The Snooper SC5900 DVR Ventura will only route you along appropriate roads for your large vehicle. Simply enter your vehicle dimensions and weight and then you will be routing accordingly avoiding low bridges, narrow roads, etc. This makes your journey in your caravan or motorhome much easier as you will not need to plan ahead thinking about potential low bridges, weight restrictions and narrow roads, etc. The maps included is Europe mapping. Furthermore you get Lifetime maps so your mapping will always be up to date. You can select up to 16 multiple destinations to go to along the single journey and the Snooper will calculate the shortest route. The screen on the Snooper SC5900 DVR is a 5-inch widescreen which is also touchscreen. Another great feature is called 'My Speed XL' which displays the speed limit for every road on the screen in a large format. The Snooper will also display in large format your current speed so you will always know when you are driving above the speed limit for the particular road you are driving on. Free traffic information technology shows where there are traffic jams and the Snooper satnav will route you around the delays saving you time sitting in traffic jams. The dashboard camera built-in to the Snooper SC5900 DVR records in continuous mode so it will record over older videos as the memory card reaches full capacity. The dash cam will also record the GPS location of incidents, time and date. Vehicle speed is also saved to the recorded videos. A built-in microphone will also record sounds such as commentary during recording. Low Emissions Zones (LEZ's) are also routed around, for vehicle with high polluting emission. 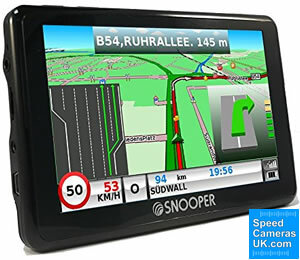 Snooper SC5900 DVR will always calculate the shortest, quickest route from A to B. Junction View feature will display main motorway junctions on the full screen so you know where to turn and which lane to get in. Lane Guidance feature further helps you to know which lane to get in for your next turn. You can also navigate by junction number. 'Your Route' feature allows you to select specific roads to include for traveling along for your journey. This enables you to personalise your route. TyrePilot is compatible with the Snooper SC5900 DVR so you can check tyre pressure and tyre temperature which will be displayed on screen. This optional feature will provide audible alerts for tyre pressure drops and abnormal temperatures. Using TyrePilot will result in safer, more fuel-efficient driving and extend the life of your vehicles tyres. Bluetooth technology enables you to make bluetooth hands free calls. Points of Interest database included with the Snooper SC5900 DVR include hotels, petrol stations, train stations and more. There is also a POI corridor search that suggests POI's along your pre-programmed route so you will always be aware of nearby stops such as Petrol Stations. 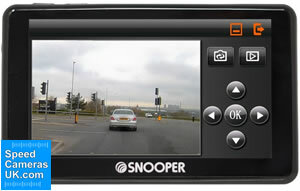 Snooper Player software can be used to playback recorded video from the dash cam on a Windows computer. In total there are three different Snooper SC5900 DVR sat navs these are: SC5900 DVR Syrius (for cars and small vans), SC5900 DVR Truckmate (for trucks and HGVs) and S5900 DVR Ventura (for motorhomes and caravans). While all four models have the same features e.g. a 5-inch touchscreen display, FREE TMC traffic updates and FREE sat nav map updates the different models are preloaded with different software which are designed to get different motorists or more accurately different vehicles safely from A to B. If you drive a car or a small van then you need to buy the Snooper Syrius SC5900, if you drive a truck or larger vehicle such as a high-top van then the Truckmate SC5900 DVR with its truck attribute database is the model you need. On the other hand if you regularly tow a caravan or drive a motorhome then the Ventura SC5900 DVR is the model to buy. All models also feature a car mode for use in mutliple vehicle types. To view the Snooper SC5900 DVR PDF manual click here. Looking for more information on the features of the Snooper SC5900 DVR Ventura sat nav or how it installs in your vehicle, etc? View the SC5900 manual by clicking the PDF logo below. The manual opens in PDF format. UK, Ireland, France, Spain, Portugal, Italy, Austria, Switzerland, Belgium, Holland, Luxembourg, Germany, Denmark, Norway, Sweden, Finland, Poland, Estonia, Lithuania, Czech Republic, Latvia, Liechtenstein, Hungary, Romania, Slovakia, Slovenia, Serbia, Montenegro, Croatia, Turkey, Greece, Albania, Bosnia and Herzegovina, Bulgaria, F.Yugoslavia Rep.of Macedonia, Russia. Like all Snooper speed camera detectors and sat navs, the Snooper SC5900 DVR gets its speed camera locations via the Snooper AURA speed camera database. Updated daily, the AURA database can be downloaded to the device via a PC connected to the Internet with USB connection. It's important you regularly update, as the SC5900 GPS database is only as good as the last download. AURA database is available via subscription from the manufacturer and priced at either £2.99 a month, £7.99 a quarter or £29.99 a year. The Snooper SC5900 DVR will only operate on Windows or Mac computers. Specifically, you must be using Windows 7, Windows 8, Window 8.1 or Windows 10. Additionally the software will only work with Mac OS 10 Yosemite and higher. Updates via Windows based PC or Mac computer. We use PayPal on SpeedCamerasUK.com as an easy method to make your purchase. If you'd prefer to pay with a debit/credit card or would like to pay over the telephone, you can telephone 01733 777 623 (Monday to Friday - 9:30am to 5:00pm). Delivery is FREE on SpeedCamerasUK.com for orders over £50.00, however on ActiveGPS there are more options including guaranteed next working day and guaranteed Saturday delivery. 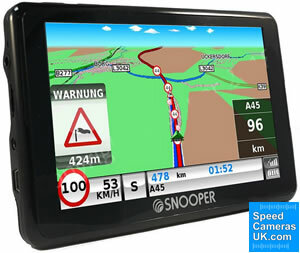 All of the sat navs at SpeedCamerasUK.com are also available to buy from us and include FREE delivery within the United Kingdom (UK). For deliveries outside of the UK please see delivery information for costs.